There are three primary destinations in the spiritual world, which has innumerable spiritual planets and expands without limit. The topmost planet in the spiritual realm is Goloka, Krishna’s personal home. In Goloka the Lord lives like a simple cowherd boy, and His devotees serve Him with the sweetness of intimate personal relationships. Goloka is larger than all other spiritual planets combined and is far above them. When Krishna comes to this world He brings Goloka with Him, as He did 5,000 years ago, showing all the extraordinary, beautiful features of God’s original home. The other planets in the spiritual world are called the Vaikuntha planets. Lord Krishna's expansions as four-armed Vishnu rule these planets like kings, worshiped in awe and reverence by innumerable devotees. All the spiritual planets float in what is called the brahmajyoti, the spiritual effulgence of the Lord's transcendental body. Devotees immersed in pure love for Krishna or Vishnu reside in Goloka and the Vaikuntha planets. 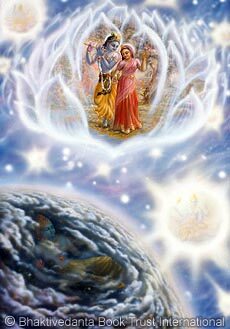 Self-realized souls who have yet to awaken their natural love for the Lord may temporarily reside in the brahmajyoti.